The Pima County Sheriff’s Department will be helping us remember what Independence Day is all about by improving on the historical excesses of the writ of assistance as used against the colonists prior to the revolutionary war. The Sheriff’s Department will be conducting sobriety roadblocks on July 4th and 6th of this year while augmenting roadblocks with saturation patrols throughout the upcoming weekend. The department will be conducting these roadblocks absent any reasonable suspicion, general warrant or writ of assistance – hence the ‘improvement’ over the old British system where agents of the state were burdened with carrying a piece of paper authorizing their excesses. 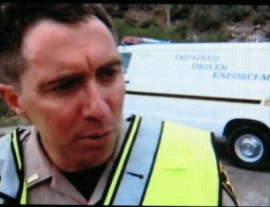 These roadblocks will be ignored by the state legislature and rubber stamped by the judiciary despite the lack of any state law authorizing the use of suspicionless roadblocks against the traveling public and in defiance of state law that only authorizes peace officers to stop an individual when they have reasonable suspicion of wrongdoing. Since September 3, 2005, the Pima County Sheriff’s Dept has conducted 71 suspicionless sobriety roadblocks. These operations have been paid for in full by the National Highway Traffic Safety Administration via the Governor’s Office of Highway Safety. Police officers are paid overtime from this federal grant money for their participation in the violation of your traveling rights. From those 71 roadblocks conducted over the past 21 months, only 282 dui arrests have resulted out of a total of 48,781 suspicionless seizures and 1,168 field sobriety tests (every stop represents a seizure under the 4th amendment). This means that the overall dui arrest rate for all roadblock operations in Pima County over a 21 month period is a paltry 0.6%. Additionally, only 24% of individuals coerced into taking field sobriety tests were arrested for dui indicating the police were wrong 76% of the time reasonable suspicion allegedly existed to demand an FST. Conveniently enough, the county sheriff doesn’t publicly track the number of successful prosecutions of those arrested for dui so we really have no idea what the actual dui rate is in the county. After all, we are presumed innocent until proven guilty in a court of law and an increasing number of dui cases across the country are being thrown out due to shoddy police work or perjury on the part of the arresting officer. A complete list of prior Pima County sobriety roadblock locations including statistics generated by the county sheriff is available here. A check of dui fatalities over a similar time period shows no statistically significant change in Pima County as a result of these 71 roadblock operations. Additionally, studies conducted around the country show that roving patrols are ten times more effective at removing drunk drivers from the road based upon reasonable suspicion than sobriety roadblocks. Roving patrols also require about 1/3 fewer man-hours per operation than roadblocks. This raises the question of how many drunk drivers weren’t removed from Pima County roads over the past 21 months because the sheriff’s department was too busy playing “Shock and Awe” games with the general public that already drives impaired free at the 99.4% level. For anyone interested in the proliferation of suspicionless checkpoints in general, I have a comprehensive site coming together that covers a wide range of suspicionless checkpoints being conducted across the country. Wishing everyone a safe and enjoyable holiday – both from drunk drivers who would put you at increased risk and those who have forgotten why we even celebrate Independence Day to begin with.